We kicked off this monumental show with a Brother versus Brother match, featuring Duane and Edd Stone... 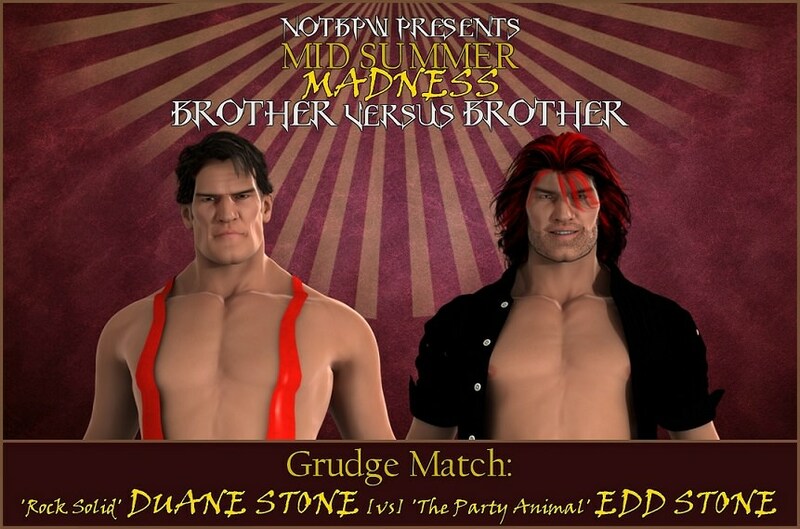 The two remaining active Stone Brothers won the NOTBPW Tag Team Titles last month, but after the match, Edd dropped down to his knees, and low-blowed his older brother... Since then, Duane has tried and failed to get his hands on Edd, but 'The 24 Hour Party Animal' has managed to escape... Tonight, Duane finally gets his hands on Edd...!! The bell rang, and Duane Stone was like a caged animal! He flew across the ring, and knocked Edd Stone silly with a barrage of forearm smashes to the side of Edd's face!! Luckily for Edd, he was able to drop to the floor, and roll out under the ropes to take a breather. Edd could run, but he couldn't hide or escape. This was a singles match after all. Duane slid out after him, and chased him around the ring until he caught him! Edd was slammed off the ring steps, and off the announce table. He threw Edd into the guard rail, and continued to beat him up. Duane continuously broke the referee's ten count, and kept the match on the outside of the ring, but eventually Edd saw an opportunity to slam Duane into the apron! The older Duane has a history of minor lower back injuries, and his lower back smashing off the apron caused him a real problem as the match wore on. But Edd didn't just target Duane's lower back. He also targeted his nether-regions! The dirty Edd broke all the rules and constantly tried to attack Duane below the belt! He succeeded in hitting THREE low blows behind the referee's back, and one more right in front of him while Duane was on the top rope! Edd kicked the top rope, and Duane fell hard! The referee couldn't disqualify Edd for the move, as it wasn't technically illegal, but he got in Edd's face and was furious with him. It wasn't long after that that Edd ascended the top rope himself. He dropped his 'Party's Over' Elbow Drop on Duane's back to end the match, with Duane laying on his front! The agony poured out of Duane Stone's eyes... His back was ravaged during the match, not to mention his crown jewels... He could barely climb to his feet following the bell ringing after the pin fall victory for Duane's younger brother Edd Stone... Duane ended up in a heap on the outside of the ring, while Edd celebrated on the stage!! Where do the two brothers go next...?! Can they co-exist on the same roster...?! Throughout this match, we cut to Robin DaLay, sat in the front row watching his father compete to try and save their careers! He looked concerned most of the times it cut to him, because John Maverick and Julian Watson were like a well-oiled machine. Everything they attempted came off in a big way, and Derek Frost was no match for their cohesiveness. He couldn't tag out, and despite having a fresh Dan DaLay on the apron, 'Bad Reputation' looked in real trouble of being done in NOTBPW! However, somehow, some way, Frost managed to hit a double 'Snow Plough' (Spear), and then began to crawl to his corner. With the crowd willing him on, he reached out, and DaLay was tagged in!! The burly 320lber exploded into action, chopping down both Mavericks! In the end, he planted his 'DaLay Down' Headbutt on Julian Watson, while Derek Frost took care of John Maverick on the outside! Sonny Wildside and Sean Deeley were set to lock horns next... This rivalry has centred around the night Ernest Youngman joined up with Deeley's group 'The Shooters'... On that night, Wildside defeated Youngman in a singles match, but was then attacked by Deeley, Youngman, Dean Waldorf and Marv Statler... Wildside is 'The Man Without Fear', and he's spent the last few months trying to prove himself to Deeley and co... He definitely doesn't want to be part of their group... That's for sure... But he wants to show Deeley how good he is... and wants to climb the roster, fast!! 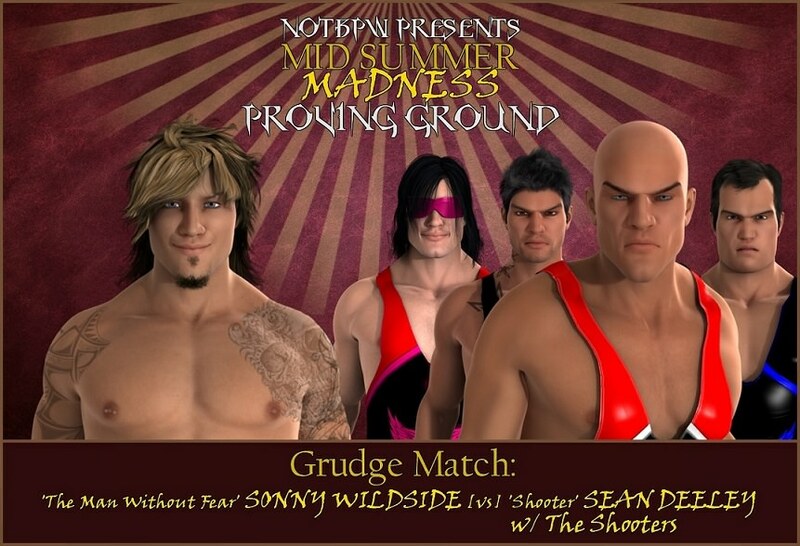 Very good match here, as Sonny Wildside's stock continues to rise. He had a decent run as Champion in the developmental territory when it first opened up, but since then he's had some fantastic matches on the Main Roster. His opponent tonight didn't care about any of that though. Tonight was all about him, and he was determined to be the man to stop Wildside's crazy momentum! Deeley had a lot of help at ringside, in a verbal, and physical way. Ernest Youngman, Dean Waldorf and Marv Statler were a huge help, but Sonny Wildside soon took them all out with a suicide dive through the ropes!! Youngman took the worst of the move, and Statler actually didn't feel much affect from it. He was able to hop up on the apron late on and provide the distraction. This allowed Deeley to lock Wildside in his 'Front Choke Lock'!! Wildside fought and fought but couldn't escape, and he had to tap out! This match was hard-hitting, and absolutely insane at times. All six men knew how to handle themselves in this match, and also knew how to use the ladders to their advantage. It was Cameron Vessey and Christian Price that went to work early on, using the ladders as weapons. They hit all four of their opponents with a variety of ladder shots, and caused all kinds of chaos. Thrill Seeker and Jacob Jett soon took over though, using their agility to set ladders up and jump off them onto their opponents! Late on, a member of each team were climbing the two large ladders set up in the middle of the ring. Owen Love and Jacob Jett were on one ladder, while Cameron Vessey was on the other. Vessey managed to hop down, and lift the other ladder up from the bottom. As the ladder fell, Love and Jett tumbled over the top rope and through TWO tables that were set up originally by Love and The Natural! Owen Love and Jacob Jett were hurt, there's no question of that. After falling from an enormous hight, and landing hard, it's no surprise that severe damage was done! From then on, it was 2 on 2. It broke down into Cameron Vessey and Christian Price against Thrill Seeker and The Natural, but not by design. The two fan favourites came out on top in that battle, and then both began to climb the ladder! Seeker was able to land a brilliant high cross body from the top of a ladder, onto Vessey and Price, and it opened the door for The Natural to climb the remaining few steps and reach up! He grabbed the Championship Belts and raised them up in both hands from the top of the ladder! 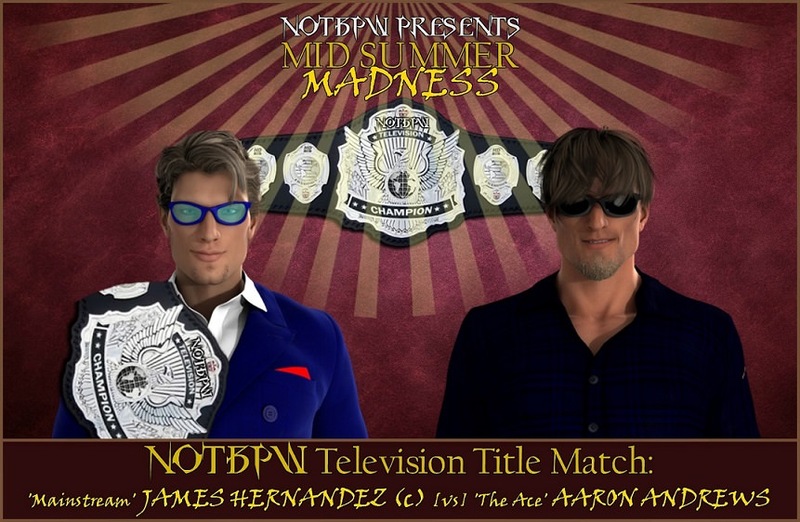 The next match saw 'Mainstream' James Hernandez defending his NOTBPW Television Championship against 'The Ace' Aaron Andrews... If you looked at a tale of the tape for these two, you'd be forgiven for thinking they were the same person... Maybe brothers... They took different paths in their careers to get here to NOTBPW... Hernandez heading to SWF for a year after successful stints with MAW and FCW... Aaron Andrews worked for TCW for TEN years after graduating from TCW's training school... But despite their different paths, they have similar skill sets... Only one of them can walk out as Television Champion tonight... and the only real differences could be: James Hernandez's 3 year experience edge... and his 'Champions Advantage'! Evenly matched before the fight, and evenly matched throughout it, James Hernandez and Aaron Andrews fought hard for almost 15 minutes here. They were both absolutely determined to walk out as NOTBPW Television Champion, and were both almost impossible to keep down. Both Hernandez and Andrews battled hard, and hit all of their trademark offence. A super kick from Hernandez caused a nearfall, and an Aaron Andrews flying body press brought the same result for 'The Ace'. As the match wore on, it looked increasingly likely that we would go to a time limit draw! But it was clear both men would risk it all for a clean result, ensuring there would be no re-match! Andrews attempted his 'Hot Shot' (Spanish Fly) finisher, but Hernandez countered it, and sent Andrews into the turnbuckle! He hit hard, and as he turned around he was hit even harder by the 'Apparition #14' Spear from the Television Champion! A close fought, but ultimately successful Title defence! 'Mighty' Danny Cavanagh and 'Iron Man' Tim Westybrook have had an interesting couple of years... For the first year, they were a strong tag team known as 'Iron Might' and they were a real force in the tag team division, even winning the NOTBPW Tag Team Titles a little over one year ago... Then the break up came... Westybrook thinking he could do more on his own, and in their resulting feud, Westybrook injured Cavanagh... A few months passed, and then Cav returned, and beat Westybrook... and it looked like the rivalry was over... but 'The Iron Man' wasn't done with Cav... This will be their 'Final Battle'... Who will walk out victorious...?! Another excellent match, and an excellent way to end the rivalry between these two former tag team partners. Using the word 'match' is probably not quite accurate, as that word would imply that wrestling took place at some point. This 'match' actually resembled more of a fight than anything else. The look on Danny Cavanagh's face when Tim Westybrook connected with a hard discuss elbow was the look of a man who was about to throw up. He looked completely out on his feet, and frankly he looked close to death!! He ended up hitting back with a discuss elbow strike of his own; his one causing a black eye to Westybrook, and his chiselled looks took a battering from that point on. His lip got a nasty cut on it following another elbow strike from Cavanagh, and blood matted up his big beard. Both men looked like they'd been in a war, but there could only be one winner in the end. As Cav came off the ropes, Westybrook was able to hit his 'TNT Whirlwind' finisher and in the end was just one step quicker than his rival when it counted. The match was over, and Tim Westybrook had his hand raised... He didn't exactly look like the winner though... His left eye was beginning to turn into a thick black/purple colour... and his lip was cut badly... Blood was still pouring out of it, and his beard was covered in blood... He also walked with a slight limp... But he looked happy... A smile crept across his blood covered, black-eyed, face... What's next for these two big former tag team partners...?! Standing in the way of 'The Monster' will be the three active members of the DeColt family: Steve, Ricky, and current Canadian Champion Jack... Steve is a veteran of the ring, who at 43 years old, has seen it all in the business... But he's never fought Gargantuan before... Ricky is the 'Young Gun' of the family, who has a ton of potential and a bright future... As for Jack, his style of fighting could be the most similar to Gargantuan... Can the 'Wild Man' fight fire with fire, and brawl his way to what would be a historic Title defence...?! Or will the odds be too much for the six-time World Champion...?! Throughout this incredible Main Event, questions were asked of all four competitors. Gargantuan began the strongest, making light work of all three DeColt brothers with big boots and clubbing clotheslines that had Alex DeColt in awe at ringside! It soon became apparent that the only way the three active DeColt Brothers could win; or survive, was to work together, like old times. But things are not like they were. The DeColt Brothers have an unrivalled hatred of one another, and their hatred is deeply rooted! Ricky DeColt seemed to be the most sensible of his Brothers, and was the first to suggest teaming up. Steve and Jack reciprocated, and they all began to circle 'The Monster'. He didn't seem too worried, but when Ricky slid under him and hooked both of his ankles in a kind of bear hug, he knew he was in trouble. Big Steve DeColt hit a big boot, and Jack began whaling on him with fists and kicks! Before long, they had Gargantuan down, and were sliding him out of the ring!! Gargantuan never saw the announce table coming until his head was slammed off it by Steve DeColt. Jack and Ricky DeColt then began setting the table up to put 'The Monster' through it. With a monumental effort from all three men, they lifted Gargantuan's massive frame onto Steve DeColt's strong shoulders, and the three of them hit a power bomb, sending Gargantuan crashing through the announce table! Almost as soon as Gargantuan hit, Jack DeColt sprung to his feet, and hit a flying knee under Steve DeColt's jaw! Jack then took Ricky by the hair, and dragged him into the ring! Jack stood over Ricky, kicking and prodding at his younger brother, and then screamed at him that he should LAY DOWN for him!! Jack wanted Ricky to lie on his back, and be pinned, so he could walk out as STILL Canadian Champion. But Ricky refused, and attempted another ankle bear hug!! Jack didn't see Steve coming from behind him, and Steve knocked him over with a bludgeoning club to the back!! 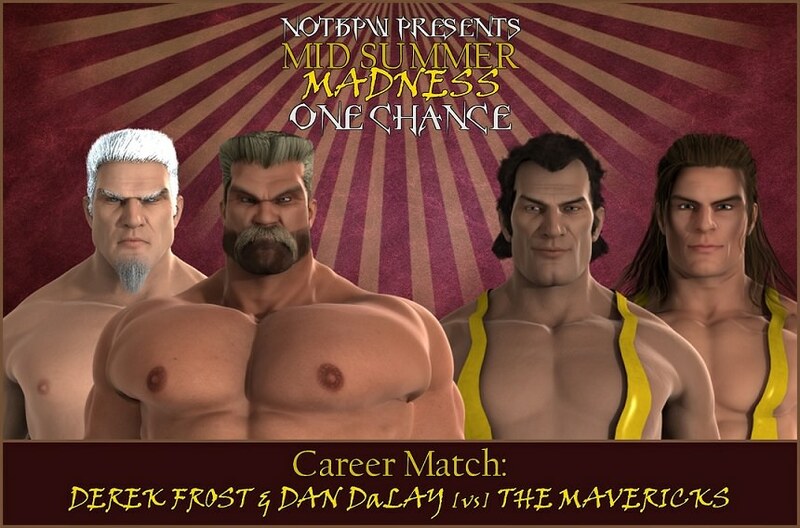 From that point on, this match became a Triple Threat Match between the three DeColt Brothers. Jack DeColt was targeted somewhat, but when Ricky DeColt went for a cover, it angered Steve DeColt to the point of wanting to snap Ricky's shoulder in an arm-bar! Luckily Jack didn't want Ricky to tap, so he stomped on Steve until he relinquished the hold. Things were getting intense, and near falls got closer and closer, but the DeColt Brothers didn't realise that they hadn't done nearly enough damage to Gargantuan until it was too late. 'The Monster' rose slowly from the pile of rubber he'd been lying on, and he got ready to teach the DeColts a painful lesson! Ricky DeColt made a huge mistake next, attempting a dive over the top rope. Gargantuan caught him, and slammed him down with a power slam on the outside! Steve DeColt was then lifted up almost out of his boots, and slammed with a double choke bomb! This left Jack alone with Gargantuan, and the 'Wild Man' backed away. Jack DeColt was smart to keep his distance from Gargantuan, but he couldn't for long, and eventually he knew had to fight. So he exploded out of a corner, ducked a clothesline, and went for Gargantuan's tree trunk-like legs! He tried to keep the big 350lber at bay, but in no way, shape or form did it work! It was an unwinnable fight in the eyes of the announce team, and Jack couldn't overcome the odds! Gargantuan hit another power slam on Jack ONTO Steve, and both veteran Brothers laid out flat in the ring. Ricky DeColt made another mistake next, attempting a diving cross body from the top rope! Again Gargantuan caught him, and then he popped the 'Young Gun' upwards. He threw him up for his 'Ultimate Backbreaker', and Ricky was broken in half. Gargantuan used all of his weight to press down on Ricky's shoulders, but it was unnecessary. The gutsy DeColt Brother was pinned, and we had a new, dominant, Champion! Winner: and NEW NOTBPW Canadian Champion: Gargantuan!! 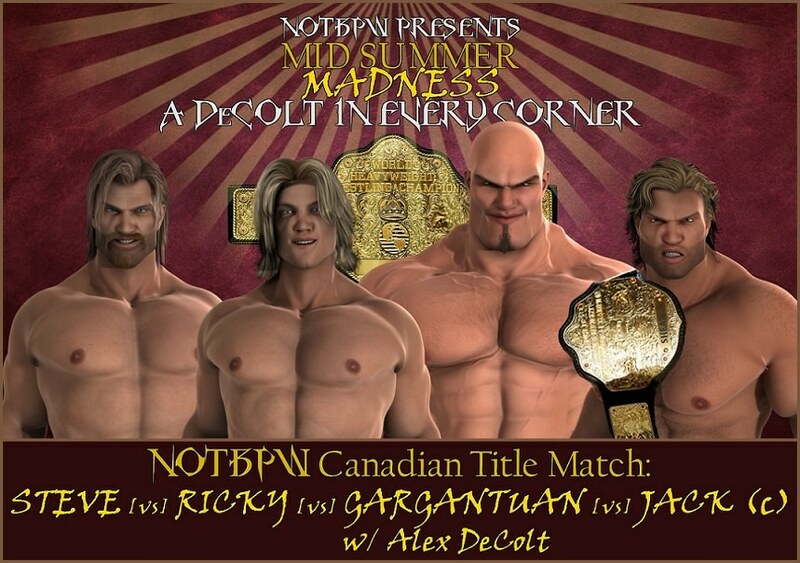 Alex DeColt handed the NOTBPW Canadian Championship to Gargantuan, and the big man snatched the Belt from Alex's hands... 'The Monster' didn't even look like he'd broken a sweat, despite suffering a triple power bomb through the announce table, by the other three DeColt Brothers... He didn't look like he'd been hurt by the exchange, or by any part of the match... He's undefeated in almost 18 months, and was CGC World Champion when he was signed by NOTBPW!! It's only taken Gargantuan 18 months to rise to the top of NOTBPW, and now can anyone stop him...?! To WIN the NOTBPW Tag Team Championships! To RETAIN the NOTBPW Television Championship! To WIN the NOTBPW Canadian Championship! Last week was a slow week, but this week isn't... Firstly, Sean McFly has signed for USPW!! I didn't have anything for him creatively to be honest, but I did TRY to keep him... USPW's offer was for 5 years, which for a 43 year old seems a bit much... but I've ensured he has enough time in his contract for one more match... and will appear at NOTBPW's July show: Jeopardy! !